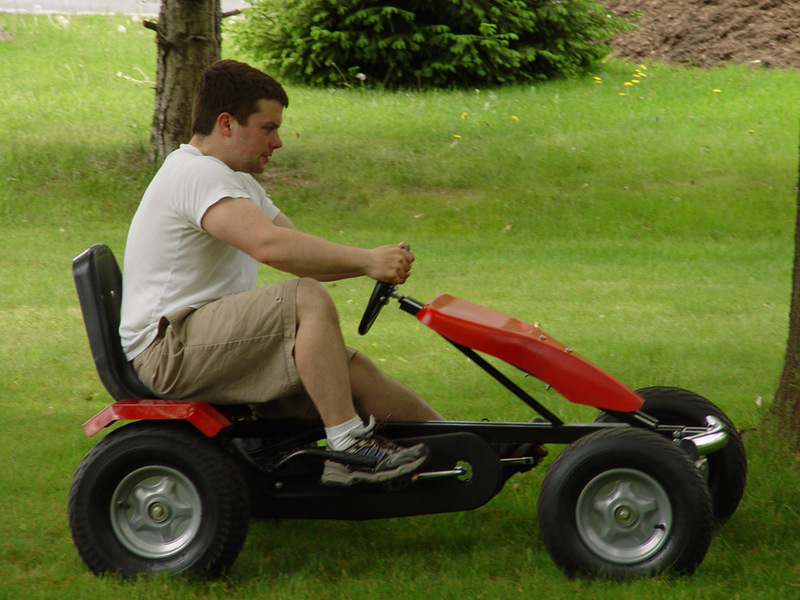 Introduce the thrill of off-road racing to young riders with our rugged all-terrain pedal go-cart. Its durable steel frame is built to withstand punishment and its heavy air tires effortlessly tackle both rocky trails and smooth pavement. Features hands-free clutch for freewheel and reverse drive, lever-style hand brake, and padded steering wheel. Adjustable seat and telescoping steering wheel (5” extension) for optimal driving position. 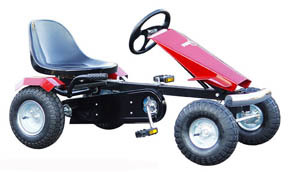 • Materials: Durable steel chassis, air-tires. • Hands free clutch for forward, coasting, and reverse driving. • For ages 3-5 yrs. Rear Wheel	Two 11” x 3 ( 3.50 - 4) Tire with 4” steel rim. Ball bearing Rim 37 mm width, 142 mm diameter. Frame	51 mm Tube. 99 cm Long. Steering Ball Bearing joint links. Drive	Single Speed 1 pc crank, 115 mm. Clutch	Forward, reverse and free wheel. Pedal	100 mm plastic with reflector.